May is the month that my father comes to visit from the UK for his spring holiday, so he can celebrate his birthday in company. For the past five years he has also brought his young brother (aged 84!) – my Uncle Ray – and these two widowers enjoy being waited on, relaxing in the warm sunshine, and having a few outings for sightseeing, drinks, and meals out. My Dad is still pretty fit and often goes for long walks by the sea near his home on the south coast of England. Ray, who had a hip replacement op early last year, walks very little and seems to have lost a bit of confidence in striding out. While he soaked up the sun on our terrace (Ray couldn’t be a more apt name for this sun worshipper), Dad was keen to have the occasional walk around the valley. 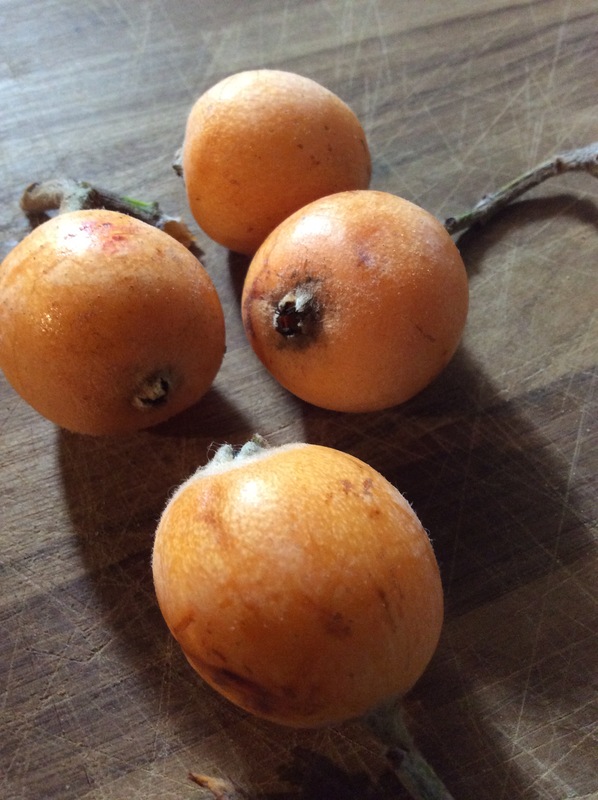 On our last walk we met Llorenzo, a friendly farmer down in the valley, who – in typically generous fashion – invited us up to his orchard to collect ‘nisperos’ (in the UK we know them as loquats). This fruit – about the size of a small plum – grows in abundance on Mallorca, although it was originally from the Far East. Most ‘nisperos’ fall to the ground unpicked here, because there are only so many of them that you’d want to eat. We’ve often seen this fruit on the market in Manacor but haven’t bought them because they often look bruised and a bit ugly. And, frankly, there are so many different fruits to enjoy on Mallorca. But, when ripe, they are quite delicious and juicy – although they have some pretty hefty pips inside. My tip is to peel off the skin first with your fingers and just pop them into your mouth (discreetly spitting the pips out once you’ve eaten the fruit). Plenty of recipes exist for those who have the time and energy to prepare the fruit. ‘Nisperos’ may be messy to eat fresh from the tree but they’re packed with vitamins and minerals. So don’t be put off trying a few if you see them for sale on the market; beauty is more than just appearances! 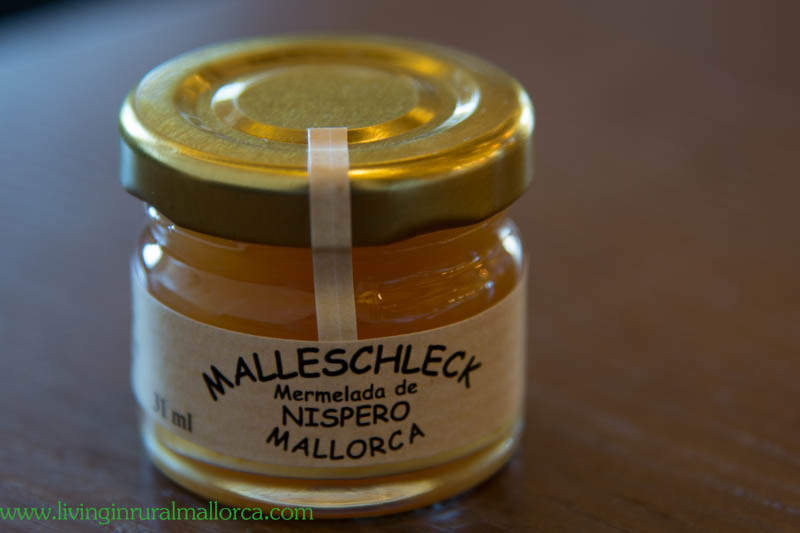 Footnote: We recently stayed one night at the new Park Hyatt Mallorca, near Canyamel, and found this little pot of locally made (by a German) ‘nispero’ jam on the breakfast buffet.